Wear your state pride on your shoulder with this personalized tote handmade from recycled sails. Wear your state pride on your sleeve, er, shoulder, with this stylish tote. 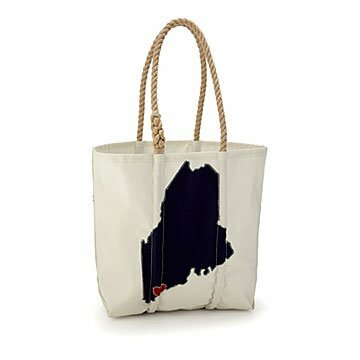 Handcrafted in Maine from recycled sails and topped off with an easy-to-carry rope handle, this durable, machine-washable bag can be customized with the shape of your favorite state. And to show some extra special, hyper-local love, you can even choose where on the state the heart is placed. Home is where the (embroidered) heart is, after all. Handmade in Portland, Maine.